BRZ/FR-S Strut Tower Brace - Any Interest? ATTENTION: The Group Buy is officially CLOSED! Check out our website for more information or to purchase your brace! It's official, ladies and gentleman. Strut bars are back from powdercoat and are looking really sharp! Most of you have been following it's development since day one, but for those that haven't, what you see here is the very best and most cost effective strut tower brace available. In both simulated and on-road testing, we're able to show that the factory triangulation bar actually do their jobs quite well! The only missing piece is a rigid bar tying both strut towers together, completing the triangle, and let me tell you, what a difference it makes. From the moment you pull out of the driveway, you'll feel a stiffer front end. Less creaks, noticeably smoother and more stable over cracks/potholes/etc and much snappier steering response. I wouldn't say it if it weren't true, but you don't have to take my word for it! We're back at it again folks, and once again we're looking for your input! In our previous ft86club collaboration, the hood struts, the ideas and responses from the community here were very valuable. With your help we were able to release an extremely successful product with ideas and features that YOU want. So please, once again, any and all input is welcome whether you have a question, concern, idea, or just want to hit us with some motivational words! Most people are aware of what a strut tower brace does, but aren't entirely aware of why they want one. So what does it actually do? Most people would say: "It stiffens up the front of the car." But what does that accomplish, and how does it actually make your car better? Lets start with some expectations of what it SHOULD be doing: A properly designed strut tower brace should reduce movement between the strut towers, which results in more predictable handling characteristics. What you should notice as a driver (especially if you have sticky tires and complimentary upgrades) is increased response, turn-in, and traction. This is accomplished because you are minimizing a portion of the chassis as an additional deflection in the suspension system, which removes some unwanted changes in camber, castor, etc. An additional side effect of adding a strut tower brace that is often overlooked comes from reducing chassis flex. Reducing movement will reduce fatigue, which is useful for increasing the structural longevity of the car itself. The first thing that we did before developing any concepts was to determine if these cars actually benefit from a strut tower brace, as we're not interested in providing a part that does nothing. These cars already come stock with triangulation bars to provide additional rigidity, so we wanted to determine how effective these were, and if we wanted to design a brace that included them as well. We will touch on the specifics of our testing in another post, but in the interest of brevity we'll summarize our testing and results here. We made a very simple brace out of metal that fit on the studs on the strut towers that the triangulation bars are bolted to. We then took several data sets with our Faro Arm with and without different combinations of the stock triangulation bars and prototype strut tower brace. We did this to compare how much the strut towers were deflecting when we jacked up one side of the chassis to a calibrated height. This is NOT indicative of the lateral loads the strut towers see in cornering, where the forces are much higher and specifically located. Instead, this test is much more simplified, and results seen here will be more exaggerated when applied to real life cornering. I took several data sets and then compiled them looking for trends. In my software I held one strut tower in place, and measured the differences in deflection in the other strut tower. I'll post a picture here showing some quick visual results. The blue stud represents the car sitting on the ground, completely unloaded. The yellow stud is the car loaded (jacked up to a calibrated height) with the triangulation bars and our prototype strut tower brace. The green stud is the car loaded with just triangulation bars. Finally, the red stud is the car loaded without the triangulation bars or strut tower bar. What this initially shows is that the stock triangulation bars do a pretty decent job of minimizing deflection. It also shows us that adding a strut tower brace to those triangulation bars does an even better job at that task. Let the designs begin!!! We've whipped up a few designs in CAD, just to get moving, and we're interested in showing off a couple to give you an idea of the direction we're headed in. These will most likely be made in steel, and powdercoated textured black. Use these quick concepts as a jumping off point for your ideas, and let us know what you like, what you don't, what is important to you, and what isn't, we want to hear it all! Re-read this post a couple of times, take a look at the pictures, visualize it on your own car, then come back and let us know your opinions! I'll be updating this thread often as this project progresses, just the same as we did on our thread about the hood struts. We literally can not wait to hear your ideas, so don't be shy! Last edited by GrimmSpeed; 10-01-2013 at 10:56 AM. This list represents those interested in being contacted when the bars are ready to ship. We'll be offering you guys a killer group buy price (TBD) that's way below MSRP. Being on this list, or adding yourself, in no way commits you to purchasing! Last edited by GrimmSpeed; 09-06-2013 at 12:28 PM. I agree it should be welded, not hinged. It should also be solid, not hollow and very strong as to not bend under extreme forces. I like the example in the pictures and where it is mounting as long as there isn't any unwanted flex on those points in the chassis compared to the strut bolt points. If you're able to keep the price around $100 (ideally exactly $100) then I'd buy it. I'd also like an option for different colors like textured red, black, and blue. I'm curious to see how much this will actually benefit the chassis, as it already seems pretty stiff to begin with. Most testing I've seen shows that it takes QUITE a bit of stress to make these things worth it (Outside cosmetics, obviously. The ricer in me thinks they look badass.). If anyone can produce some reliable data it'll be you guys. Subbed for interest! Function = Benefit notwithstanding... from a purely aesthetic standpoint... I like the simple clean look and wonder if you are considering having replacements for OEM braces so that there is a consistent "look and feel" (i.e., texture, etc.). If so.. .then +1 on offering in different colors. Welded solid, I wouldn't mind preload adjustment, powdercoated semi gloss black (to match the stock bars better). Where do I send payment? Forgive the crappy MSPaint rendering but could you not have it mount something like this? Something about mounting it solely to that piece of metal that is tack welded onto the strut tower seems flimsy to me. Other than that, love the solid, no hinge design. 1. Would be cool to have grimmspeed versions of the stock triangular bars as well (optional) which is nice since they are separate pieces and don't need to be purchased if not wanted. 4. If the main bar shares the same bolts as the stock bars, maybe having hardware that has longer threads, I know it would be nice to just use the stock hardware, but if calls for it, it might be worth it. That's something I've found with the password jdm struts, they are short in my opinion. I like how they don't surround the entire circle around the struts, I think they just need to hit those two points you have or the 3 on the inside. I like the design, it's not too big and it's simple. If its affordable I may ditch what I have haha. It's nice to have something we all collectively have input toward. I like the idea of a solid bar. OEM-looking paint like the hood struts would be awesome. Optional paint colors would be welcomed, like red or blue at least, or maybe a color that better compliments your logo. It gets kinda messy when you offer colors, though, since it's nearly impossible to color-match and compliment aftermarket parts. The angle of my reasoning: I plan on getting the blue engine cover, so a blue bar has a high chance of looking tacky stretched across the engine bay, not matching the engine cover's blue color. Are the stock mounting studs designed to withstand the extra pressure from the strut bar? Are they long enough to withhold their length and integrity with having another part bolted to the chassis? Overall, I'm for this. I know your price will be reasonable. I expect it to cost more than $100, but not a whole lot more. 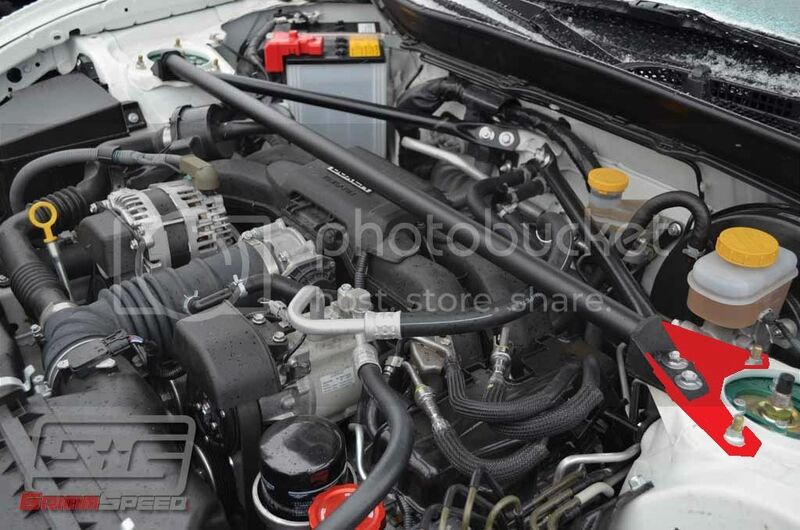 Do you find any benefit in using the strut mounting bolts to mount the strut tower bar? Does this increase rigidity? I know that many are looking to save cost by using the OEM triangulation bars, but would there be any benefit in incorporating these in one solid triangulation bar? If so, how much?